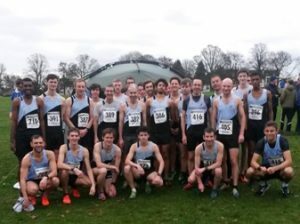 On Saturday 12th January, R and N senior men took part in the third Birmingham League cross country event held at our home course in Abington Park in Northampton. R and N had a near record turn out with 27 finishers and comfortably the best performance ever! The standard of the race was, as ever, extremely high, with the race being dominated by international athletes. The R and N runners were not far behind, however! After the first of the four laps, the leading R and N athlete was William Gardner in 14th place followed by a group of three other R and N athletes, Dominic Jones, Mussab Hussan and Elisha DeMello in around the 30th position. As the race continued all the R and N athletes showed excellent pace judgement as they moved slowly through the field. Eventually William finished in an outstanding 10th position, followed the group of three, who finished within 4 seconds of each other. Dominic claimed 16th position, Mussab 18th and Elisha 20th. The team comprises the top 6 finishers for each club and the runners behind performed excellently. Haydn Arnall had an incredible run to claim 36th position, to emphasise the improvement made in the last months and the final scorer was international triathlete, George Goodwin in 55th position. Further down the field, the B team (the next 6 scorers) performed really well with Adam Searle, making his Birmingham League debut, in 65th , Adam Wright in 80th, Jordan Simmons in 107th, Finn Hutton in 112th, Alistair McDonell in 116th and Dave Ball in 126th. The final team score saw R and N eclipse their best ever performance as they finished in 4th position, with the B team claiming 3rd position. Well done to all that ran. The final race takes place on 9th February in Telford.